One of the great things about Loka Snacks, is seeing what Dave comes up with each week. Although last week people loved his gobi manchurian dish, we found great beets this week so we served this whey fermented beet carpaccio. The fermented beets have an awesome flavour, not quite as acidic as pickled beets but not as mushy as roasted beets. This may be my favourite way to eat them. Although I still love the raw beet salad I make too. I loved the dish so much I really wanted to share this beet recipe that requires some patience but is well worth it. 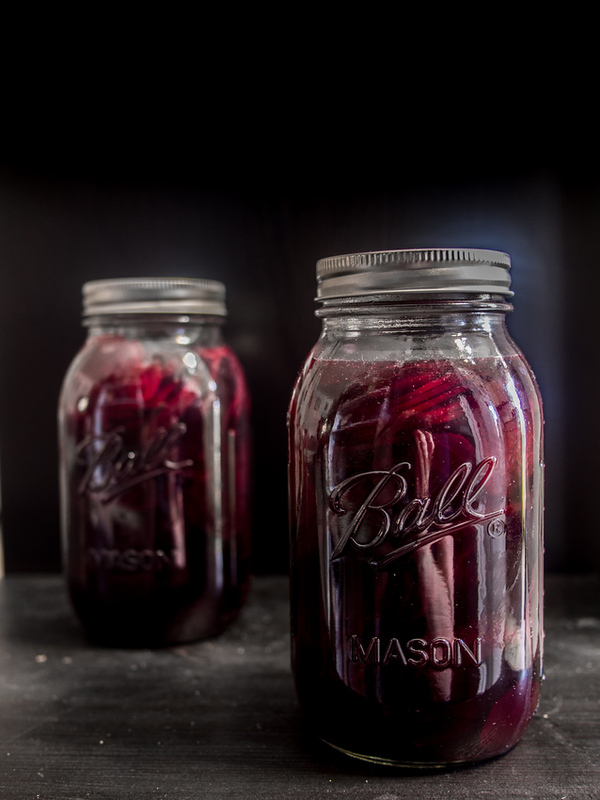 The fermented beets are roasted for 3 hours and then fermented 3 days. The actual carpaccio doesn’t take long to make at all. 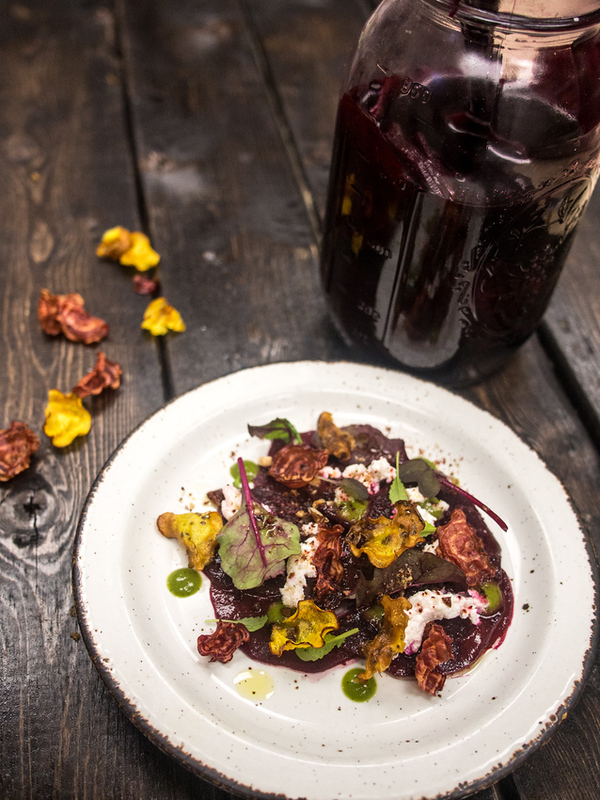 Most of the work for this beet carpaccio recipe is fermenting the beets 3 days in advance. Once that is done it's easy to make the carpaccio. Remove beets from brine. Toss fermented beets with burnt honey mint vinaigrette and a bit more salt and pepper. Place six slices of beet on each plate. Sprinkle with ricotta, toasted hazelnut and top with beet microgreens. Optional: Add slices of beet chips for added texture and drizzle with a bit of bergamot oil. Sprinkle tin foil with a bit of sea salt. Prick beets with fork all over. Rub with 1 Tbsp oil and wrap in tin foil. Bake at 300 for 3 hours, let cool. Peel and slice beets 1/8 inch thick. Burnt honey lasts indefinitely so you can make a batch and use it in many dishes. If you don't have the time just substitute with plain honey. To make burnt honey, put honey in oven in a pan and bake at 400F until dark amber colour, 500ml takes about 40 minutes. You will know it's ready as oven will smoke. I am all about the beets. I just made a batch of soup with a kraut I made of cabbage, fennel and watermelon radish, plus grated beets. Delish! It looks delicious i am going to try it!!!! I love your photos of this food, but I have to admit I’m not sure the food sounds good…. Wow this sounds and looks awesome! I’ve never tried fermenting beets before, but I’m interested in doing more preserving this summer/fall. This looks absolutely incredible! I can’t wait to make it. Oh my! Now my mouth is watering! Yummy. Would like to try this for tomorrow BBQ party. Looks like I’ll have a new recipe to try when I settle in my next apartment … cheers! It’s a great one and so easy to make.